CO2 removal specialist C-Capture has secured £3.5m investment from BP, Drax, and IP Group to help further develop chemical processes designed to cut carbon dioxide emissions from power stations and industrial facilities, it announced today. The new equity funding was raised in a round led by BP Ventures – the oil giant’s venture capital arm – as well as tech investor IP Group and energy firm Drax. The funding injection will be used to develop C-Capture’s technology, support larger pilot projects, and increase marketing efforts globally, the UK firm said. 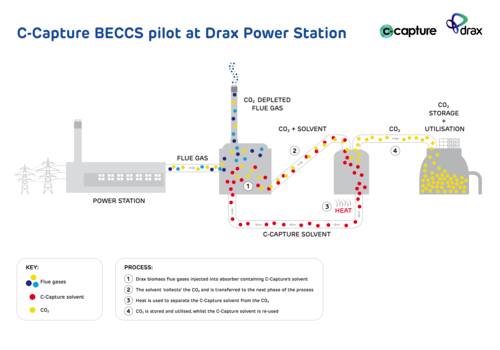 C-Capture is currently conducting a demonstration project at Drax Power Station in North Yorkshire, where its chemical system is being trialled to remove around one tonne per day of CO2 emissions from one of the energy giant’s biomass power units. It marks the first Bioenergy Carbon Capture and Storage (BECCS) project in Europe, which Drax believes could potentially pave the way for it to become the world’s first carbon negative power station, whereby CO2 released when burning sustainably sourced biomass is removed from the atmosphere and stored. Tristan Fischer, chairman of C-Capture – a spin-out company from the University of Leeds – welcomed the funding raise, and said the firm’s “unique” technology had the potential to be applied at scale around the world to help tackle climate change. The firm’s technology uses proprietary solvents to remove CO2 from the flue gas, which it argues offers a safer and less expensive alternative to many other CCS technologies, making the removal of carbon dioxide “significantly more economic from a range of large-scale processes”. Formed in 2009 at the University of Leeds, the firm has raised over £2.2m from the UK government and £1.7m from IP Group so far to develop its technology. David Eyton, BP’s group head of technology, said carbon capture use and storage (CCUS) technologies had a key role to play in reducing emissions. “Our investment in C-Capture supports our ambition to advance the energy transition, and we look forward to working with them to explore opportunities to trial their technology,” he said. The funding announcement came as Parliament’s Scottish Affairs Committee today published a report on the future of the oil and gas industry, which called on the government and the UK’s Oil and Gas Authority take a proactive approach to encouraging the re-use of retired oil and gas infrastructure to support the development of the fledgling CCUS industry. It also suggested the government should consider underwriting liability for such infrastructure. Moreover, the report said the government should set out a clear plan for funding CCUS in the UK, alongside a detailed proposal from the oil and gas sector for how its three centres of excellence could support the deployment of carbon capture technology. Stuart Haszeldine, Professor of carbon capture and storage and director of Scottish Carbon Capture & Storage (SCCS), said depleted oil and gas fields could be used to securely story CO2 and that the skills and expertise of the North Sea oil and gas sector would be crucial in enabling the UK to develop a CCUS industry. “Scotland and the UK can be leading beneficiaries of CCS by making the right business decision, which is also the right environmental decision. CCS will enable a Just Transition for the people of Scotland, supporting the move away from oil and gas towards a future that has stable, high-value local employment while delivering reduced or net-zero carbon budgets,” he said.